If your silver (amalgam) fillings make you feel self-conscious when you smile, or it's simply time to replace them, consider tooth colored fillings. 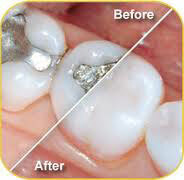 We provide different shades of the filling material and pick the shade that will match your natural tooth color best. They are just as durable as they are attractive! Tooth colored fillings are strong, stain-resistant and require less removal of your tooth structure than amalgam fillings.